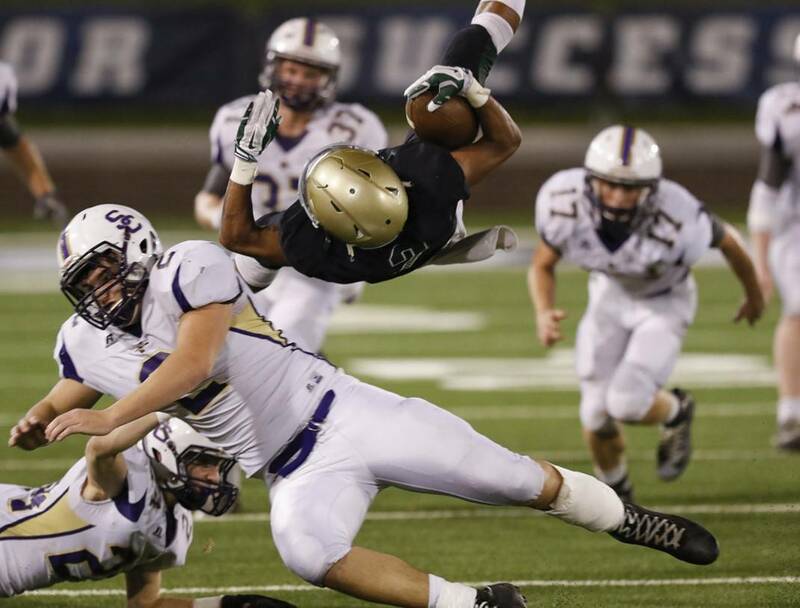 Sequatchie County High School linebacker Kyle Cates upends Notre Dame's Andrew Banks during a game last season at Finley Stadium. Cates is entering his third year as a starter and expected to be a defensive leader for the Indians. › Team to beat: DeKalb County. “In high school football if you’ve got a good quarterback you’re always going to have a good chance,” Sequatchie coach Adam Caine said. He was referring to DeKalb senior QB Steven Jennings, a preseason all-state pick and the region’s 2015 offensive player of the year. He has quality targets in Matthew Poss and Christian Pruitt. › Watch out for: Grundy County. Tate played a number of sophomores a year ago. That experience and extensive strength training, coupled with coaches’ enthusiasm, should begin paying dividends. › Best game: If DeKalb performs to expectations, a playoff host role could be on the line the ninth game of the season (Oct. 28) when Sequatchie travels to Upperman. › Dream schedule: Two of the final four regular-season games will be at home for DeKalb, which hosts Sequatchie County on Sept. 30 and Upperman on Oct. 20. Their two away games that month are against Grundy County and Cannon County. › Nightmare schedule: Sequatchie County opens with Sequatchie Valley rivals South Pittsburg, which will be among 1A state title contenders, and Whitwell, which was among the area’s 1A playoff teams a year ago. Then it’s two region games — Smith County, York — before the always-important rivalry game against Bledsoe County (Sept. 23). They end a regular season with no open dates on a five-game region run. › Players to watch: Jennings is among the state’s top prospects in both football and baseball. Sequatchie’s John Higgins was named the region’s 2015 offensive lineman of the year and LB Hunter Davenport was selected as the top defensive player. › Predicted order of finish: DeKalb County, Sequatchie County, Upperman, Grundy County, Smith County, York Institute, Cannon County. One Region 4-3A football team is keeping a low profile as a new season approaches. Another is trying to stay under the radar. "I don't know if it's by design or just working out that way," Grundy County coach Casey Tate said. It's by design for Sequatchie County, and coach Adam Caine is doing his best to keep it that way. "We're trying to keep a low profile — hoping to sneak up on some people," he said. There are different expectations for each team, though. "Where we're at, nine of 10 people will tell you it'll be us and Cannon (County) fighting at the bottom," Tate said. "My kids have worked so hard. I know we're improved," he added. "Everybody on the team can lift weights the right way now, and a year in the weight room will make a difference." Of the region race — which also includes DeKalb County, Smith County, Upperman and York Institute — Caine and Tate agreed on the favorite. "DeKalb is going to be really good," Tate said. Said Caine: "From everything I'm hearing, DeKalb has got that really good quarterback back, and they supposedly beat Soddy-Daisy and Trousdale (County) in the spring. It seems everybody is trying to catch up with them. They have 10 or so back on each side of the ball." From there the coaches had different thoughts. "Upperman's probably second, and we're battling for third or fourth," Caine said. "We have our hands full. We have a chance. We've got a good senior class, but we have to stay healthy and keep getting better." However, Tate said: "Sequatchie will be strong again. Everybody is thinking Upperman will be down, but they have 80 or so out. I'm excluding us, but I think it'll be Smith County, York and then Cannon. "We had a close game against York and threw a pick late against DeKalb and got beat by eight. We're better than we were. Everybody has a different work ethic." That ethic definitely includes sophomore quarterbacks Ethan Nunley and Hagen Cash. "Ethan became our starter, but Hagen hurt his knee early and missed the rest of the year," Tate said. "They're both going to be on the field offensively, regardless of who the quarterback is." Tate also mentioned Kevin Castro and James McDaniel among more than a dozen players he talked about. "Castro was a big help on defense, and he's embraced the role of a senior leader," he said, "and James missed three games and still just missed 1,000 yards." Defense is expected to be a strength for Sequatchie, with linebackers Kyle Cates and Hunter Davenport serving as the anchors. "They're workhorses," Caine said. "Each will be a third-year starter. Cates missed a couple of games with an injury, but Davenport was voted defensive MVP in our region last year." Depth could be a challenge. "I'm afraid we'll be playing a lot of kids (on offense and defense) — it could easily be six or seven," Caine said. "So, yeah, we'll be spending more time on conditioning, although a lot of that is built into the way we practice." Contact Ward Gossett at wgossett@timesfreepress.com or 423-886-4765. Follow him on Twitter @wardgossett.